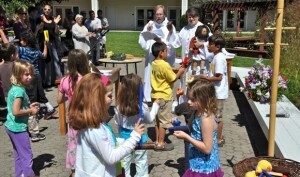 The bright sunshine and children were the stars of church this morning at Trinity in Menlo Park. It was the first of a series of summer outdoor services, which will be held on the last Sunday of every month through August. In addition to the “come-as-you-are” atmosphere that goes hand-in-hand with outdoor worship, the service was shaped to meet the spiritual needs of grade school age kids and to get their active participation throughout. For example, the children heard the Bible story focusing on Jesus’s image, “I am the vine, you are the branches” and helped the Rev. Mathew Dutton-Gillett act out just what that might look like using humans as the vines and th kids as branches. Kids also wrote out – or drew – the prayers to be prayed by the congregation and gathered around the altar table for the blessing of the bread and wine (pictured top). The shorter-than-usual service – another accommodation for children – concluded with the kids picking out a musical instruments to play along (pictured above right) with the concluding hymn. Ice cream sundaes capped off the morning. “We’re trying something new this summer,” said Matthew, who is Trinity’s rector. “Next month we’ll have a camp song focus with musicians from Bread Camp” [a summer camp for kids held at Bishop’s Ranch]. The date for that service is June 26; Trinity Church is located at the corner of Ravenswood and Laurel in Menlo Park.